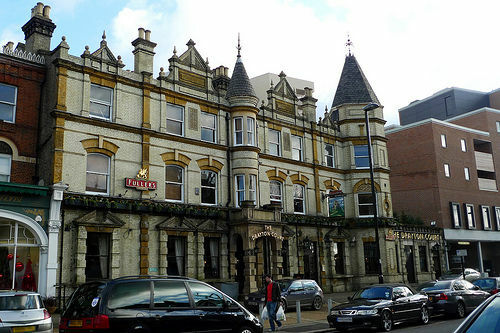 The Drayton Court pub is owned by Fullers, a well-known and respected brewery based in Chiswick. The pub is actually one that’s very local to us and we regularly go there for comedy events and to watch international rugby. We haven’t had Sunday lunch at The Drayton Court for over a year and previously were not overly impressed, so expectations for the food were not that high. Things have changed, and very much for the better! Firstly, I need to let you know about the venue. It’s big, and I mean really big. One the right-hand side of the building is a main bar area with a pool table and large screen. There are smaller booths, with their own individual screens, and another TV on the wall next to the bar. Moving to the main bar, there is a very nice fire, with old fashioned chairs, comfy sofas and an alcove with TV. There is then another separate room; I believe it’s called the “sitting room”, where we ate today. This had a nice, roaring fire (mixture of coal and wood), amusing framed pictures of cork-screws on the walls, huge centre-piece lights, nice relaxing Sunday afternoon Jazz music and a general shabby-chic feel. The Drayton Court is known in the area for its comedy club, which is downstairs in another room (again, very nice, normally used for events or wedding receptions). The most mind-blowing part of the pub is definitely the garden though… It is MASSIVE! When there are big sporting events, they have a large projector screen outside. There is also an outside bar and a barbecue area. It’s such a treat having a nice outside area during summer in London. Definitely the best pub garden in Ealing (and perhaps West London). On to the whole point we were there, the Sunday Roasts. One caveat beforehand, I read that they had a reduced menu selection due to the kitchen being renovated, completing at the beginning of December. Therefore, the menu selection was a bit cut-down. Only one dessert was available and the rest of the menu was smaller than normal. The roast selection was good though, offering topside beef, leg of lamb or chicken. I went for the lamb, Claire decided on the chicken. Whilst waiting, we decided to “sample” a bottle of the Rioja… around £18 a bottle, it was one of the more expensive wines but was very nice. There was a good selection of beers, ranging from the usual pub lagers to some more interesting Fullers specials. They also had lots of bottled beers too, if neither the wine nor drafts take your fancy. After around 20 minutes, the roasts came out… The plates were piled high! 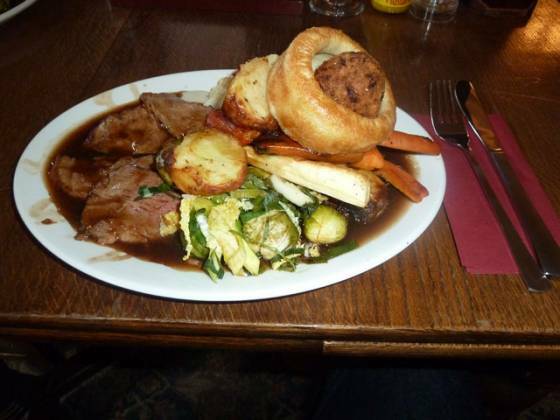 I had a number of slices of lamb, with a Yorkshire pudding and stuffing. Diving in, I found 5 roast potatoes, roasted carrots, roasted parsnips, brussel sprouts, cauliflower cheese (always a very welcoming surprise! 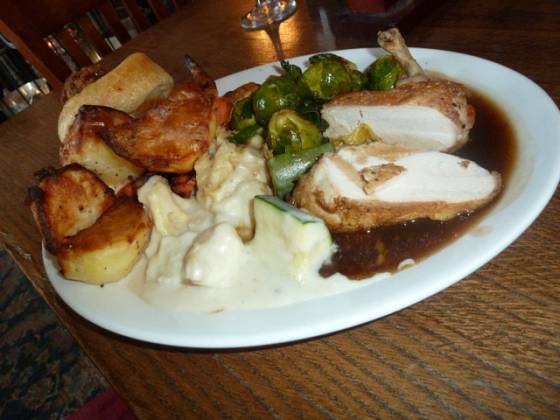 ), shredded cabbage and leaks… All complimented with lashings of gravy. Claire’s (supreme of) chicken was also a similarly plentiful affair, with not so many carrots but courgettes instead. We were extremely impressed. My lamb was very tender and whilst the chicken wasn’t seasoned, Claire was very happy with the amount. Unfortunately, the Yorkshire puddings were just “ok”, and the stuffing overcooked. These appeared / tasted pre-packaged (perhaps not the case when the kitchen is normally running? ), but everything else was freshly cooked and had great flavours. The potatoes were fantastic, and the veg were excellent, sprouts did seem a bit “al-dente”, although once eating them they were very good. Overall, the Sunday roast was just what the doctor ordered, top marks! We were asked once whilst eating whether the food was ok, and when someone came to clear the plates, we were asked whether we want dessert or coffees. It was good that the staff were unintrusive and friendly; it made me feel welcome but not obliged to make small talk. Mind you, whenever we have been to The Drayton Court, the staff have always been very good. In summary, this was an excellent pub / almost gastropub Sunday lunch. The service was efficient, yet personable. The quality of the meat was excellent, selection of vegetable fantastic with loads of gravy, slightly let down a bit by the Yorkshire and stuffing. The venue has so many facets; it makes the whole experience right for families and friends. Whole-heartedly recommend The Drayton Court for Sunday lunch… so much so, we have booked our yearly friends Christmas gathering here! Possibly a review on this one shortly too!